Right now the State Senate is a conservative paradise. Drown-government-in-the-bathtub types Sen. Pete Kelly and Sen. Anna MacKinnon run the state budget. Social conservatives Sen. Mike Dunleavy, Sen. John Coghill, Sen. Cathy Giessel are there to make sure guns, gays, and GOD are kept in their proper place. With a commanding 16-4 majority in the Senate, it wouldn’t seem at first glance like the conservative grip on the Senate can possibly be in jeopardy, but it is. Today we’re looking at how elections this fall could sway power in the State Senate. We previously wrote an article on the situation in the State House. Check it out here if you haven’t already. The good news is an analysis of the Senate will be a lot simpler. First off, there are only half as many Senators (20) as there are Representatives (40). Then, only half of the 20 Senators are up for election every two years as opposed to all 40 Representatives. So there are a lot few moving parts to consider. The Republican-led Majority has a pretty commanding numbers advantage: so much so that the Minority isn’t even entitled to formal recognition under the legislature’s rules. This appearance of dominance is deceiving because it represents the end result of the last round of organizing. It includes rural Democrats Sen. Donny Olson and Sen. Lyman Hoffman brought into the already established 14-member Republican group. Let’s sort the field back out to where they would be at the beginning of an organizing process. As you can see in this table, Democrats are back with Democrats and Republicans with Republicans. Now the Republican lead shrinks to 14-6. In the next table we will separate this group even further into those up for election and those who are not. We also note that four Senators are retiring: Senators McGuire, Stoltze, Huggins, and Ellis. Since all four departing Senators are from districts that are very likely to elect senators who will caucus the same way their predecessor did, we will keep them similarly aligned in the table. As you can see, Republicans start off with seven guaranteed Senators returning, and the Democrats have only three. Of the seven Republican seats up for election, only Sen. Coghill and Sen. Giessel have challengers who pose real threats. None of the Democrats up look to be in serious jeopardy. It would seem even if Democrats oust Coghill and Giessel they would still be at an 8-12 disadvantage, and thus have no hope of regaining power. This is where caucus politics start to come in. Senators Stevens and Steadman represent significantly different politics than their Republican brethren. Both are from districts where fishing, rather than oil is king. 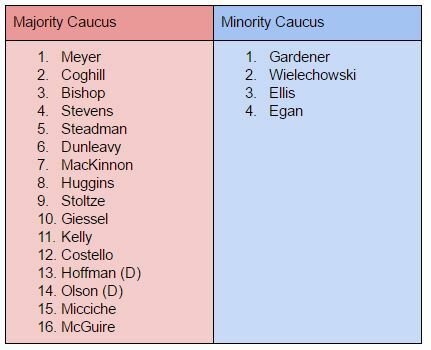 The rest of the caucus hails from pro-oil industry areas Anchorage, Kenai, and Mat-Su. Because of that, both Stedman and Stevens are far more likely to prefer organizing with more oil-skeptical Democrats than oil industry defenders in the Republican caucus. 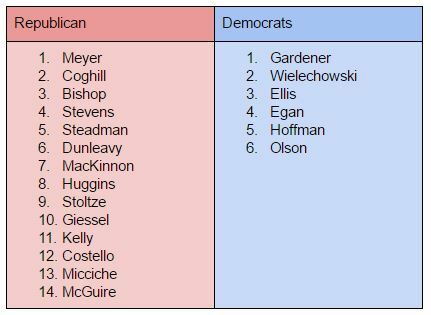 In fact, Both Steadman and Stevens were bedrock members of such a bi-partisan organization from 2007-2012. As you can see, if Democrats take the two toss-up seats they will start with a 10-10 tie with Republicans. From there it’s a race to see who can pick up one or two members from the other side. Democrats have a far stronger chance of getting a moderate Republican to come to their side than Republicans do of attracting a Democrat or winning back Stevens or Steadman. In this scenario, AFL-CIO President Vince Beltrami will have beaten Sen. Giessel. Fairbanks Republican Sen. Bishop is known to be a great friend of Labor. That relationship between Bishop and Beltrami almost guarantees Bishop switches sides for organizational purposes. At that point, a Democrat-led organization would have an 11-9 majority, and it would just be a matter of negotiating the terms for at least one of the moderate Republicans (Meyer, Costello, and Micciche) to come over and make the bi-partisan caucus 12-14 members strong. A lot hangs in the balance in those two Senate races. Whichever side wins both, wins that majority for the next two years. If there is a split, things will get interesting. Be the first to comment on "How Democrats Can Retake The State Senate"